A new production team is at the helm of a community show being staged next week. David Kiely and Brenda Joy have teamed up for the first time to direct the Morpeth St George’s Community Players’ show Happy Campers, a two-act comedy written by Richard James. It runs from Thursday, March 17, to Saturday, March 19, at St George’s United Reformed Church Hall. Richmond-born Mr Kiely prefers acting, but finds producing interesting and challenging, and the role is a dream for Londoner Brenda Joy. The play presents additional challenges for them and the cast as it is being performed at floor level and not on the venue’s stage. Mr Kiely added: “This play presents interesting challenges because it’s about camping. “Putting it on floor level, there are no boundaries. Josh Beasley, Lara Simpson and Bridget Rowbottom will line up alongside debutants Rachel Cairns and 17-year-old Matthew Hankinson, as well as stalwarts Jared Johnson and Sue Elliott. 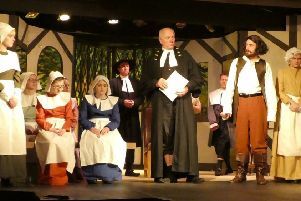 The comedy drama is set in the Yorkshire Dales, and being billed as offering fun and drama galore. It is expected to keep audiences thoroughly entertained. Tickets are available from Morpeth Tourist Information Centre and by calling 01670 623455, priced at £6 for adults and £5 for concessions.